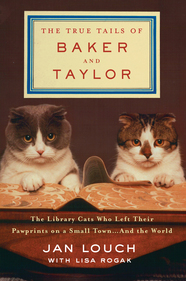 “The True Tails Of Baker And Taylor: The Library Cats Who Left Their Pawprints On A Small Town … And The World” (St. Martin’s Press, May 2016, $25.99) is now out in hardcover. Lisa Rogak, former Glen Rock resident, is the co-author of the 288-page book, with Jan Louch — the librarian who cared for the cats. The cats lived in a small library in an even tinier town in the 1980s and 1990s while serving as mascots of the Baker & Taylor book distribution company where they appeared on millions of posters, shopping bags, coffee mugs, and in hundreds of ads. The 288-page book looks back and tells the story of these two marvelous cats and the people—readers, librarians, and cat lovers of all ages—who came together around them.